The Westchester County Taxi and Limousine Commission governs the licensing and regulation of the county's taxi and limousine industry. The commission was established first and foremost to ensure safe and quality livery for the riding public and to promote the improvement of for-hire vehicle services. 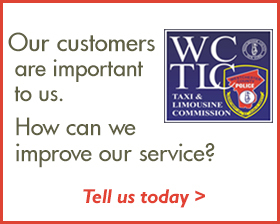 To this end, the WCTLC has a county-wide inter-municipal policy that sets forth rules and regulations for the for-hire industry in Westchester and sets standards for drivers, vehicles and base stations. The Westchester County Taxi and Limousine Commission meets monthly. For the most up-to-date schedule, meeting times and locations, go to the county calendar.